Kyoto is an ancient capital overflowing with historical and cultural treasures such as time-honored shrines and temples, and the seasonal beauty of renowned Japanese gardens. Experience the charm of Kyoto more deeply, with a photo wedding that will remain forever imprinted in your memories. What is Kyoto Wedding Association? In addition to the costumes pictured here, other designs are also available. This is an uchikake bridal robe in a vivid colour other than white often red, green or black and embroidered with gorgeous gold leaf. Although it is formal clothing for women that can be worn at the ceremony, it is generally more common for the Iro-uchikake colourful wedding kimono to be worn as a change of clothes for the reception. Various colors and designs are available, ranging from traditional styles with auspicious Japanese patterns, to modern contemporary styles. The furisode (long sleeved kimono) is the most formal of clothing for unmarried young women, however amongst these is the garment with sleeves that drape on the floor called the hikifurisode, which is the formal wear of the bride. It is common to wear black as the colour is considered the most noble, however, in recent times the amount of people wearing other coloured hiki-furisode long-sleeved wedding kimono has increased. Obi sashes and kimono accessories allow a wide variety of kimono styles. An uchikake (a bridal robe worn above a kimono), a kakeshita (the kimono worn under the uchikake), obi (belt for the kimono), accessories and undergarments, all in white, are all clothing for the bride. In Japan, the Shiromuku white kimono is the typical choice when going before the altar. 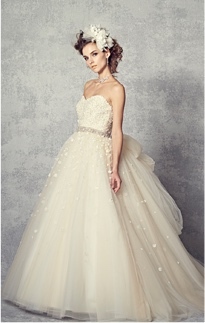 Since ancient times, white, “the colour of the sun”, has been a sacred colour and symbolises the beauty and purity of the bride’s heart. 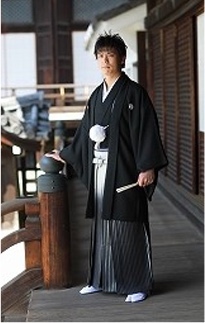 In the modern day, the Men’s Crested Formal Hakama and Haori (montsuki haorihakama) is generally regarded as the foremost piece of formal male attire. The haori formal coat decorated with crests is worn over the hakama formal pant-skirt also decorated with crests. Black is the most often worn colour for this formal attire. Enquiries*We have English speaking staff at all of our branches. Please feel free to contact us.